A really magnificent and impressive photograph frame standing 11 3/4" tall x 9 1/4". 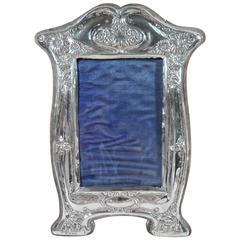 The frame has a stylish Art Nouveau shape, beautifully decorated with a stylized foliate design. There is a full English hallmark for Birmingham 1902 and also lucky enough to have an English design registration number for the year 1901. Fabulous condition with a glazed aperture measures: 8" x 6".